The Jack Georges assortment of Business & Laptop cases are available in a variety of leathers including classic American steer hide, fine Italian leather, exotic ostrich leather, or dozens of other leathers from our collections. 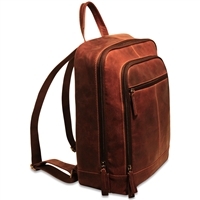 Styles include briefbags, flapover briefcases, top-zip business cases, rolling wheeled business cases, messenger bags, business totes, satchels, and even carry-on luggage. Whatever your needs, a Jack Georges bag will emphasize your sophisticated sense of style and appreciation for true quality. It has top zip closure, rounded corners to resist breakage, open front pocket, zippered back pocket, suede lining, and an inside zippered pocket. Keep your laptop computer well-protected and your everyday business essentials neatly organized in the Jack Georges 14" Leather Laptop Case. Hand made in the USA, this leather briefcase offers traditional style, function, and storage. 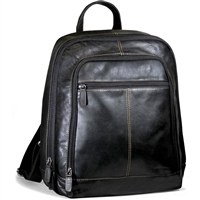 A streamlined shape and a contemporary design make this laptop backpack perfect for the professional on the go. The Voyager Double Entry Top Zip Briefcase is crafted from vegetable re-tanned buffalo leather. Hand made in the USA, this leather briefcase offers classic style, function, and storage. Looking for a special Jack Georges Leather Business Case? Please don't hesitate to contact us with any questions.